Not hopping on a plane to a beautiful tropical destination this year? Bring the tropics to you instead! Tropical florals and plants are everywhere now - patterns, artwork, and faux florals are all bringing us island vibes all year long. 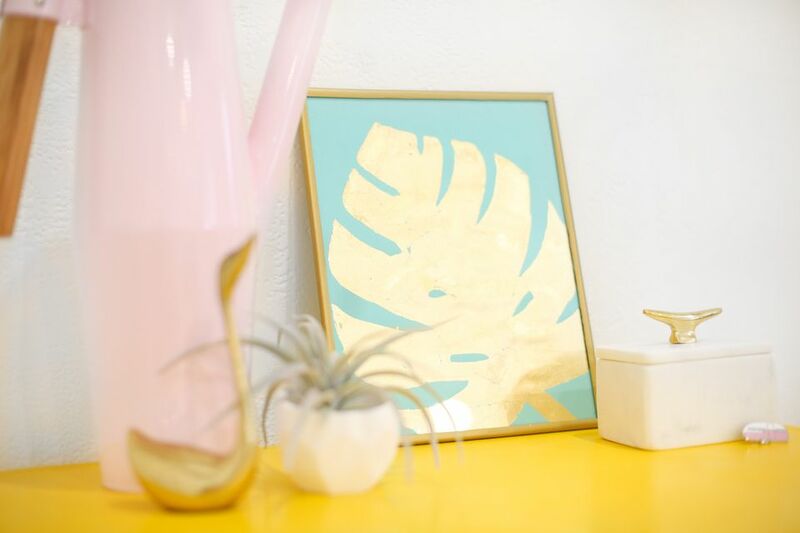 So add a little golden touch to your own home by creating this DIY gold tropical leaf art print. The gold leafing is a technique that you'll want to use over and over again, and this simple leaf art is the perfect project to test out your new skill. Customize the size and color of your background paper to suit your home. Or better yet, make a few and cluster them together for a fun gold leaf gallery! We used gold leaf for this particular project, but leaf comes in all shades! Try copper or silver to switch it up. Also, be sure that when you are choosing cardstock that the piece you have is large enough to fill your photo frame. Choose your favorite tropical leaf and sketch it out. We got our inspiration from a monstera leaf. Pencil in the outline of the leaf very lightly; just enough so that you can see it and follow the outline as you paint on the adhesive. If you make any mistakes, be sure to erase them thoroughly. Paint on a thin layer of gold leaf adhesive (also called sizing) on all the areas that you'd like to apply gold leaf. We recommend painting just a hair outside your pencil lines so that you don't see the pencil in the final product. As you paint on the adhesive, make sure that there are no areas where it is pooling. A thin, uniform layer will work best. Allow the paint to dry for 1-2 minutes, until it becomes tacky. With clean, dry hands, lay down sheets of gold leaf on all of the areas where you applied adhesive. It's okay if you need to use multiple sheets; just overlap them slightly and you won't be able to see the patchwork. Use a clean, dry, flat paintbrush to pat and smooth the gold leaf down, being sure that it adheres on all areas of the adhesive. Use a gold leaf duster brush to brush off the excess. (You can also use a medium-stiff bristle brush.) Buff away the excess gold leaf in small, gentle circles, until your design appears with clean edges. Allow the adhesive a while to dry completely. Then frame your gold leaf art in your desired frame. Put up your new artwork and prepare for people to ooh and aah!